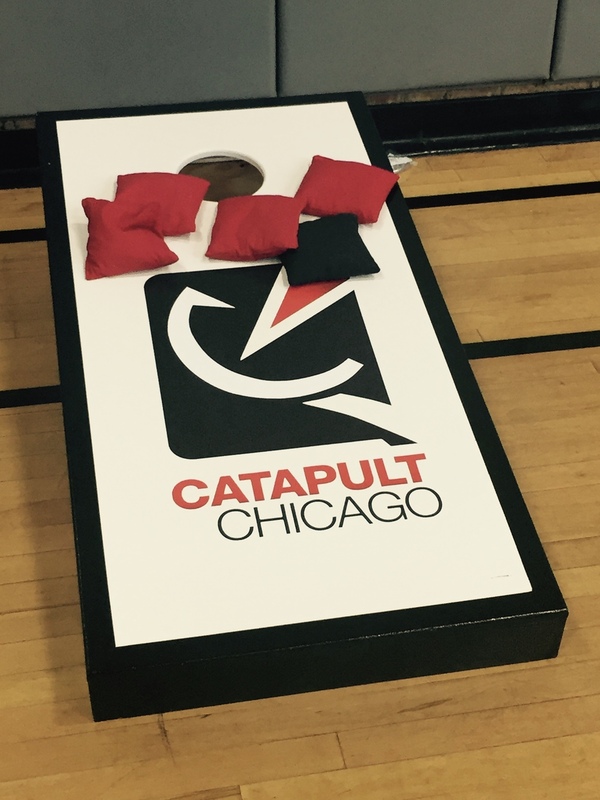 On June 25, Catapult hosted the inaugural Catapult Startup Field Day. This was a fun-filled day for Chicago’s booming tech startup community to come together for friendly competition with a basketball tournament, bags tournament, and boot camp activities. Do you remember Field Day at the end of grade school? Our goal was to create the entrepreneur equivalent to kick-off the summer with our startup friends (just with beer instead of juice boxes). The 3-on-3 basketball competition was friendly yet fierce. Eight teams battled hard in a round robin tournament, with four teams advancing to the Final 4. Team LearnCore edged out Team CDW to be crowned Field Day Basketball Champions. They won bragging rights along with a trolley ride around the city! The popular bags tournament was competitive yet less fierce than basketball (it couldn’t have been too intense if people were playing while eating popcorn and drinking beer.) Thirty teams competed throughout the day, with the top eight teams advancing to a bracket playoff. Again, Team LearnCore was victorious with a decisive win, and a custom bags set. The quality of play was impressive - for some players this was clearly not their first bags rodeo. Participants relaxed and socialized throughout the day, drinking Lagunitas beer and munching on Skinny Pop popcorn and Jimmy John’s sandwiches. Big thank yous to all of the companies that fielded teams and to all the players who participated with enthusiasm and good sportsmanship. We are extremely grateful to our generous sponsors who supported the event: CognosHR, Foley & Lardner, Henricksen, Hirewell, JLL, Palo Alto Networks, Propllr, Server Central, Wintrust Ventures; Lagunitas Beer and Skinny Pop, our food sponsors; ChicagoInno our media sponsor; and to All Sports Series and Right Fit Personal Training for organizing the event. The day went on without a hitch thanks to the All Sports Series crew, led by Holden Metz. In true startup fashion, we at Catapult faced surprises, setbacks, and successes in planning and executing this first-time event. For example, we learned that the startup community really loves bags (aka baggos, cornholes, and “that tailgating bean bag game”). We were definitely not anticipating 30 bags team. It was a pleasant surprise, but one that also resulted in a last minute scramble for additional bags sets! There were also questions raised, as in: Is there something in the LearnCore water? Are basketball and bags skills a prerequisite for getting a job at LearnCore? Hmmmmm. We’re already putting our lessons learned into the planning for the second Catapult Startup Field Day next year. Get ready for #CatapultSFD17! For a video recap, check out this You Tube video, for pictures see gallery below, and for a play by play of the day, check out #CatapultSFD16.